My work is driven by a curiosity into the investigation of mind thru art. None of us can avoid thoughts, but through awareness of our pitfalls, beauty, strengths and weaknesses we can open windows into the mind. The core of my contemplative art practice is to visually embody the blind spots as a result of our thoughts. I am interested in the study of how the mind works as a means of gaining insight, how we communicate, how we create identity through form, emotions, and consciousness, and how we hide in that creation. Essentially this work is about all of us and the empty, clear and unconditional nature of mind we all have. When we know the nature of our mind we will know the nature of our world. My abstract contemplative work is developed with the view that art has the capacity to infuse the experience of everyday life with awareness. Using my experience of passion, aggression and ignorance I delve into the discursive thought patterns and emotions that obscure the recognition of our basic nature of mind which is empty, lucid, all-accommodating space continuously awake and aware. I’m interested in persuading the viewer from the boundaries of the image, to engage with matters beyond what is immediately visible; to relate with who we are as deconstructed, uncreated, i.e. more expansive and gentle than our usual descriptions of ourselves and how the culture defines us. Everything begins as thought, then manifests as a physical reality. We are not going to fix our world without healing the patterns of thought that are driving the world into its present state. By delving beneath the turbulence of thoughts we can uncover in ourselves “something” that we begin to realize lies behind all the discursiveness, changes, and deaths of the world. This is the most rebellious act of all imbued with social impact and non-conformism to actually glimpse,then realize the profound truth. In 1978 I met the Tibetan Buddhist meditation master Chogyam Trungpa, Rinpoche who showed me the nature of mind. My path of making visual images became the inner structure of mind and how its patterns of confusion obscure recognition of this vast space of ceaseless energy. For 10 years I studied and practiced meditation with Trungpa Rinpoche until his death in1987. Since that time my work has gone through a process of increased familiarity with how mind works and how to present that familiarity thru visual images. Reflecting on our intimate connection to the environment, I chose to work with environmentally friendly paper and materials making drawings, paintings and collages using oil and powder pigment. The drawing implements are found branches, mostly hake brushes and any thing that creates a mark. I refer to instructions from Trungpa Rinpoche that said art arises from a deep connection between mind and heart, seeing from within. In other words, drawing from pure awareness without visually grasping - beginning from uncertainty, without reference point. I devised a technique which allowed the essential nature to be drawn freely without judgment, to be spontaneous and personal. I feel that paper is the most responsive material to the investigation of mind thru art, relating with whatever happens to the paper during the process of making a piece. 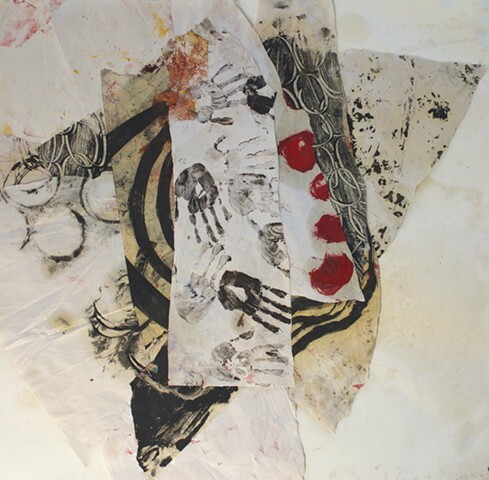 With the studio floor covered in pieces of painted paper, ripped, aged and often walked on for days or months in the process, the rhythm of art making comes alive with subconscious unpredictability. This process determines the piece with an active sense of design and circumstance, as well as accident and accumulation of everything discovered so far. Each piece pushes me towards a different way of sharing discovery. There is control without control, a puzzling together. The paper has an inherent living quality. Because of how I treat the paper it takes on added causes and conditions and accelerated impermanence. The paper will age, become fragile, be affected by light yet will remain as those things we search for and cherish possibly in the attic or basement, an archeological site or a memory, much like in our lives. Its ordinary insignificant quality becomes special. Touched in any way there's a response; a fingerprint, wrinkle, rip, drip or tear, which then becomes texture and language. The images are also a continuation of looking at ourselves thru familiar signs & symbols, abstracted representation, and how we manifest and grasp our world. Both image and titles invite you to move beyond boundaries and into a space of speculation and one’s own mind. Although using paper, brushes, oil and pigment is traditional, the way I relate with my tools and materials is rather untraditional and often meets with skepticism. However as far as how I envision what I want to communicate it works. My suggestion to anyone beginning to set foot on the path of making art is to become acquainted with your mind and your natural rhythm of being yourself. Decipher what honestly feels important to communicate in your unique way no matter what appears acceptable. Find the materials that visually and sincerely represent your vision. I began this narrative saying “my work is driven by a life long curiosity relating to the investigation of mind thru art,” describing a pattern of evolutionary experience and deep inspiration as a sort of happening that embraces our shared human situation. That work continues.